Glulam bridges are a proven solution to many bridging design and construction requirements. The high strength to weight ratio of laminated timber gives a lightweight and cost effective solution for large spans. The design flexibility of laminated timber also gives many opportunities to make a statement, particularly with graceful curved structures. 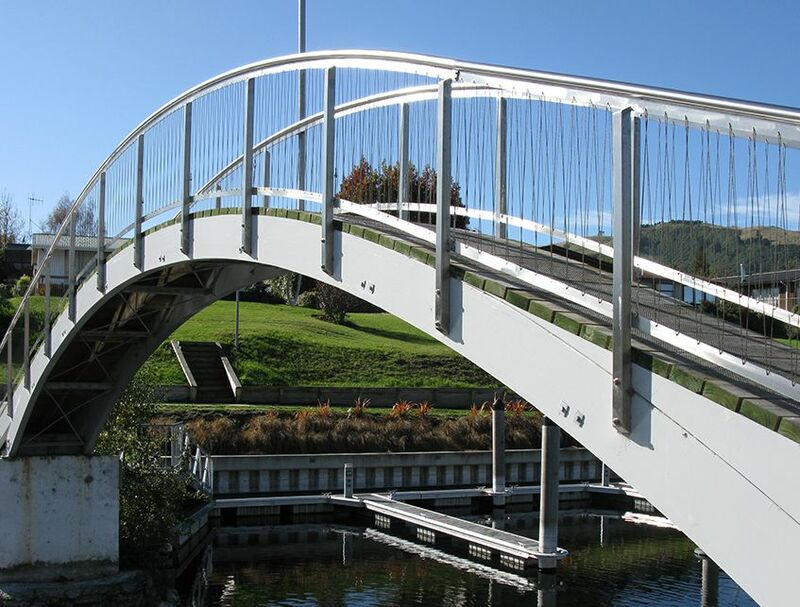 Techlam has many years’ experience in creating timber bridge structures and brings this knowledge and skill to every bridging project. Our services range from supplying main beam members and kitset packages to a fully installed solution in conjunction with industry partners and design professionals. This statement applies to Standard Techlam Glulaminated Timber products. This document provides an informative overview of the different grades and strengths of glulam, as well as useful information regarding it’s manufacture. With a high strength to weight ratio, our large span glulam bridges are light, allowing them to be lifted into remote sites. Long lasting and low maintenance, glulam provides a solid alternative to steel.